What a fun name for a sweet treat! This recipe is guaranteed to please sweet lovers of all ages. Although the name is playful and the ingredients are simple, the team at Bouchon still presents it in a sophisticated and elegant manner. Instead of a bar shape, these are individual rounds, much better for munching. A sprinkling of fleur de sel on top lets you know, these are grown-up versions of a childhood favorite. I was shocked when I read this recipe. Rice Krispies? Marshmallows? and caramel bits? 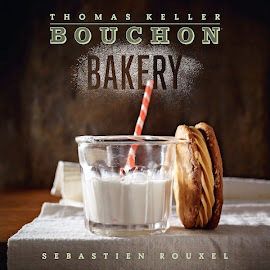 Is this the same Bouchon I've come to know and love over the past year? I couldn't believe that I wasn't making my own marshmallow, but instead buying it at the store! 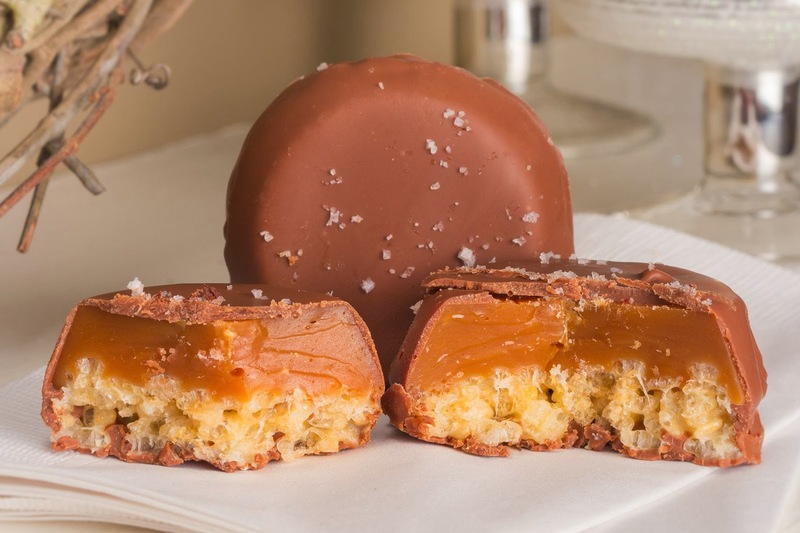 These are essentially Rice Krispie treats, all dolled up with caramel and a milk chocolate coating. Nostalgic and delicious but still refined. I couldn't find the silicone mold that the book recommends, so instead I used silicone cupcake liners. The size is about the same, and I already owned them, so it seemed like a good substitution. Although I considered not using them at all, and simply pouring the caramel over the slab of treats, then cutting into squares. But my husband pointed out that it might be difficult cutting through the hardened caramel, so I scrapped that idea. It does seem silly that I made a whole tray of treats, only to use 8 rounds. I didn't mind, since I ate the scraps over the course of the day. I forgot how amazing Rice Krispie treats are! I haven't made them in over 5 years I think. So, treats made, caramel melted, I poured a bit into each cup and topped it with a round, then let it set up. In the meantime I chopped the chocolate. I got Valrhona milk chocolate, so yum! Again, tempering was a guessing game. I used the dipping method to coat the treats in chocolate, using a gloved hand to submerge each treat. I find this is the most effective method, and produces the cleanest results. I sprinkled some fleur de sel on top and let them set up. I guess because it's milk chocolate, it took a long time for it to harden. I ended up popping the tray in the fridge for a while to speed up the process. But only after a few hours did the chocolate properly set. I cut into a round, which was difficult. The caramel was quite hard. The combination of flavors is delicious, but I think I used too much caramel, because it was hard to eat. Next time I'm up in Yountville, I will definitely try one of these at the bakery, to see how it should taste. Aside from the tempering chocolate, it's one of the easier recipes so far in the book.